Whether you’re just getting started or you’ve been on the ‘gram for a while, there’s always a chance to learn new strategies to successfully promote your Instagram account. There is a lot of competition on Instagram these days. Instagram now has over 1 billion users all over the world! Not only that, you’ve got the Instagram Algorithm to keep up with. This is to make sure that your posts get a good amount of engagement every time you post. It’s a lot to think about for sure! If you truly want to stand out and successfully promote your Instagram keep on reading to discover 12 different strategies (with examples!!) that will help you to grow your following and increase your engagement. The new Instagram Nametag feature is a fantastic tool that you can use to successfully promote your Instagram account online and offline. There are so many uses for this new feature it makes us squeal with excitement! To create an Instagram Nametag, go to your Instagram profile and click on the Nametag icon (next to your archive button). From here you’ll be able to change your Instagram Nametag background. You can choosse an emoji, a selfie (with a fun sticker) or a coloured background. Once you’ve successfully created your Instagram Nametag, you can save the image to your phone’s camera roll and start using it creatively both online and offline. * Share your Instagram Nametag image on LinkedIn, or better yet, at the end of your LinkedIn articles! * Add your Instagram Nametag to the end of your powerpoint presentation when you are presenting a speech at an event to make it easy for audience members to find you and follow you on Instagram. * If you host pop-up events or have a brick-and-mortar, print out your Instagram Nametag on a poster to encourage visitors to follow you on Instagram. PSSST -> Want to learn more about the Instagram Nametag feature? Click here for a full run down! If you have a brick-and-mortar business, or even an office with a little reception, something fun that you can use to successfully promote your Instagram is a social media counter. Ever seen one of these in action? Here’s what it looks like! You can hang it on a wall, set it on a desk, or put it on a shelf. To draw even *more* attention to your counter, you could even chuck some fairy lights around it. Now you are ready to sparkle your way to more Instagram followers. Woohoo! PSSST -> To learn more about this super duper funky social media counter, check them out here. If you know someone with a similar target market to you, with a complementary product or service, why not team up for a collaborative competition? You could collaborate with just one other business owner. Or, you could go ahead and work with a handful of businesses to put together an absolutely jaw-droppingly awesome prize. In our journey, we’ve found that the most effective Instagram competitions have an entry method where the entrant needs to follow your account and tag a few friends in the comments section to win. Instagram specifically asks that anyone running a competition on the platform includes this caption, and it is also advised to have clear terms and conditions and a cut-off date for entries. PSSST -> Need some Instagram content ideas? Here are 33 of them! Working with Instagram Influencers may seem a bit scary at first. But if you can pull together a strong campaign brief and a flipp’n awesome group of Influencers, you are sure to get a lot of bang for your buck! You may need to have a mix of micro and macro influencers in order to get the best results. It’s also worthwhile sitting down and figuring out your budget for payment. PRO TIP: Before deciding on an influencer, be sure to ask them for a media kit so that you can see their Instagram analytics and find out if they have anywhere else that they could promote you (i.e. a blog). If you’re on Instagram as a business it is pretty darn likely that you also have at least one other social media profile for your business. Where-ever else you are, take a moment to think about how you could cross-promote your Instagram profile on that other social media network. A great time to cross-promote is just a few days before you are going to announce an Instagram-exclusive competition or giveaway. Let your social media audience know to go over to your Instagram account, give it a follow, and stay updated because something *amazing* is on the way. Cross-promotion may seem simple, but it is a really effective strategy to successfully promote your Instagram account. PSSST -> Want some Instagram contest ideas that will raise your engagement through the roof? Take a peek here! Surely if you’re on Instagram, you have an email address, right?! Well, you can use your email signature to successfully promote your Instagram account. We know, we know, it isn’t rocket science… but many of us forget the power of our email signatures. It is pretty likely that you send out emails every single day to different people all over the world. If you want to gain some more Instagram followers really easily, hire someone to design a beautiful email signature that promotes your Instagram profile. Oooh… now, this is something I am excited to share with you! If you happen to own a cafe, restaurant or bistro (or something in the foodie industry) you should definitely take a moment to think about how you can sneakily promote your Instagram account in areas where your competitors probably aren’t. As an Instagram Marketer when I am going to eat somewhere I’ve never been before, I tend to look at the Instagram account of the business while going through the menu. This is so that I can see photos of what other people have had and also see what people had to say about those meals. If you’re a little bit too fancy to have the Instagram logo all up in your menu, you could instead have something at your point of sale (like the social media counter) to do all the work for you. If you’ve never considered Instagram Advertising, perhaps now is the time to do just that. Instagram Advertising is a fantastic way to successfully promote your Instagram with guaranteed results. You can advertise on Instagram Stories and in the Instagram Newsfeed with either videos or images. Heck, you can even do a combination of both if you really want to go all out! For some tips on how you can set up your first Instagram ad, take a peek at our guide right here. 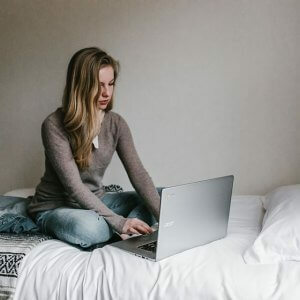 Guest writing or ‘guest blogging’ can be an extremely effective way to increase your Instagram following and also give your website some more SEO juice. Why not give it a crack?! Think about the different industry websites or online news websites where you could provide value. Then, send them a quick email with your blog article pitch. At the end of your blog article you’ll be able to have an author bio and in that bio. You can then share a link to your Instagram account. There are two different ways that you can approach Instagram Story Takeovers. Both of them can help you to successfully promote your Instagram account. With an Influencer takeover, the way that you will promote your Instagram account will be when the Influencer shares with their audience that they’ll be ‘taking over’ your Instagram Stories for a day. Usually, an Influencer would tell their audience through their own Instagram Stories as well as in a post on their Instagram grid. Even though this is pretty standard, it’s a good idea to outline how you’d like the Influencer to promote the takeover when you are just starting to discuss the collaboration. If you have a business friend with a similar target market and a complementary offering, why not team up for an Instagram Stories Takeover? You can both create content for each other’s Instagram audiences. On a set day, you can publish one another’s content to your Instagram Stories. This is a great way to share audiences with a complementary business owner and boost both of your accounts. There is power in collaboration, so give it a go! One great way to find new people to follow on Instagram (and successfully promote your Instagram) is through Facebook groups. Join a few business Facebook groups for your niche, or better yet, find some Instagram-dedicated Facebook groups that welcome promotion. It’s a really quick way to promote your Instagram account and it’s well worth trying out. Speaking at events for your industry or on a topic that you are passionate about are always going to help you to successfully promote your Instagram account; as long as you mention your Instagram account at the end of your speech! With the power of the Instagram Nametag feature, you actually don’t need to mention it at all! Just have the last slide of your powerpoint be your Instagram Nametag (after you finish your talk) The audience members who enjoyed your talk will surely make the leap to becoming new Instagram followers of yours. So, there you have it. 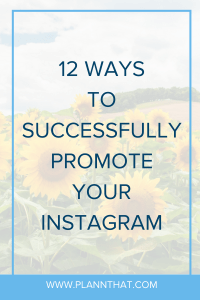 Now you’ve got 12 different strategies that you can start using right away to successfully promote your Instagram account. Ready to take your Instagram to the next level? Plann’s desktop version is on the way with even more advanced Instagram analytics, photo-editing filters and the features that you already know and love. Click here to get first dibs when it launches!